2. 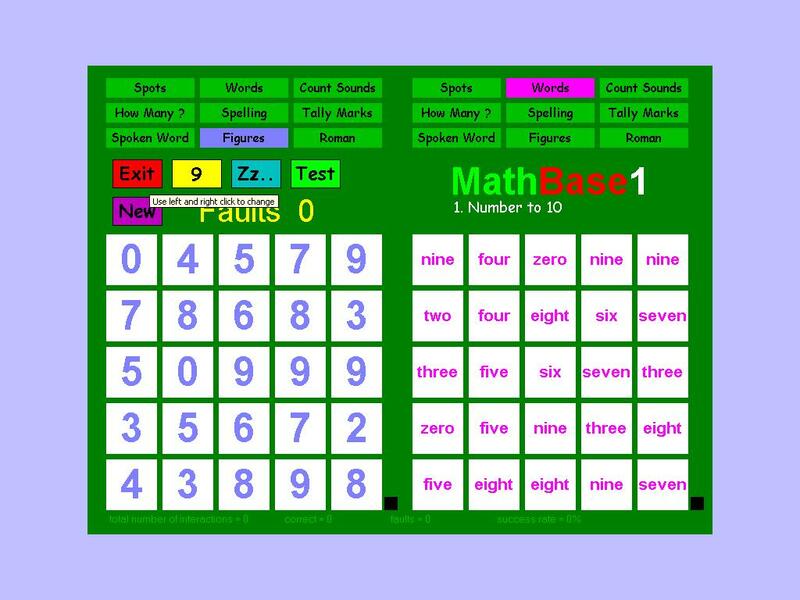 Numeracy Software for dyslexic learners. Literacy has always been the first priority for dyslexic learners, but some of the learning difficulties can affect numeracy and maths as well. Maths involves memory, sequencing, direction, vocabulary and problem solving strategies, as well as calculations. Many people’s problems with maths arise from lack of understanding of basic concepts. It is important to use concrete materials and discussion to overcome this. However computer programs can be useful for practice of basic skills and for developing problem solving. As with assistive technology for literacy, users need to be taught how to use a calculator efficiently. Teachers also need to realise that a calculator can be a useful teaching tool and not just an excuse to avoid mental arithmetic. Learning basic number facts such as tables can be a particular problem for dyslexic learners, yet access to higher levels of maths often depends on this. A computer can be helpful in providing practice, giving immediate feedback without criticism. Whilst many people perceive maths, and arithmetic in particular, as series of procedures to be memorized, it is far more helpful to approach new ideas as problems to be solved. A method that suits one learner may not be the same as that for another. Problem solving skills are essential in applying basic facts to everyday situations. There are some good and enjoyable programs to enhance these skills. There are many programs to suit learners of all ages. This is just a selection of some which have been found particularly useful for dyslexic learners and others, who may need some extra support in maths. Numbershark (Age 5 to 16 years). Numbershark is by the makers of Wordshark and has the same type of colourful, fun graphics in structured learning tasks and a similar range of enjoyable reward games. It covers number recognition, sorting, the four main rules of numbers, i.e. addition, subtraction, multiplication and division as well as decimals, fractions and percentages. It gives users the chance to build up confidence, and the opportunity to practise those aspects of numbers that worry them, in an enjoyable way. Study of the manual by the supervising adult is essential as there are so many options. A Three Stage On-line programme to develop Number Sense and Numeracy Proficiency. Dynamo Maths has been developed through extensive research and with the support of Dyscalculia practitioners. It gives children a strong foundation for the early development of Number Sense. 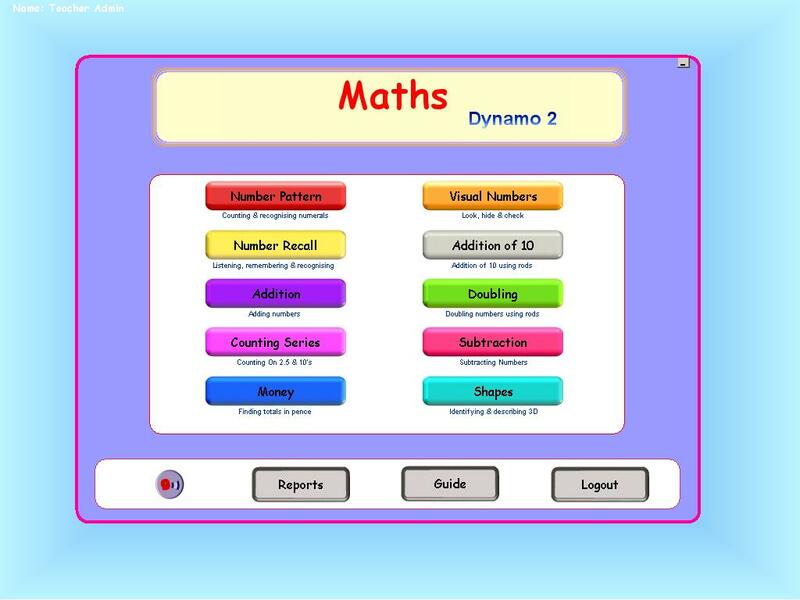 Dynamo Maths tackles early maths skills such as: Patterns, Bonds of 10, Number facts, Shape and Space, Place Value, Telling the time, Money Fractions, Pictograms etc. The programme addresses over 20 Dyscalculia difficulties such as: Subitising Auditory Memory, Number Recall, One-to-one correspondence, Visual Memory, Sequencing, etc., and is ideal for supporting and boosting the confidence of children who are struggling with maths or are dyscalculic. The programme has personalisation features that allow the Teacher or Parent to target and track students progress, select activities for individual children and set on-line homework that is marked, scored and tracked. There is also Dynamo Profiler for assessment of numeracy strengths and weaknesses, and suggestions for suitable work. This expanding set of simple reinforcement games covering the national curriculum for Maths has proved very popular and effective in many schools, and offers exceptional value for money. One advantage of SUMS is that the games run on various small hand-held devices as well as traditional computers. The instructions are not spoken but the graphics are generally so clear and simple such that this should not present a problem. Apart from school and local authority licences, a home version CD of the games is free online. The company also has similar products covering Phonics and French. These programs are based on a simple system of matching values in two grids. They were developed by a special needs teacher and now cover all topics up to the end of KS2. They are ideal for practice at basic skills. 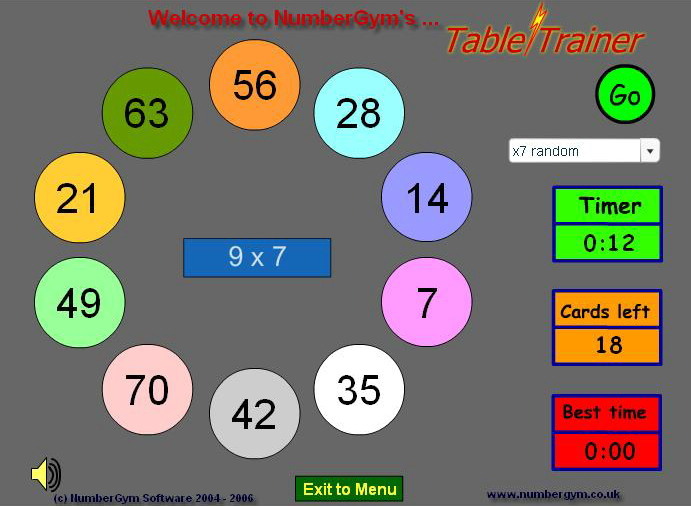 The Number Gym won the 2007 Pirelli Internet Award for the Communication of Mathematics “for its ability to provide children, by means of interactive tools and games, with an informal and fun approach to the complex world of mathematics” The activities cover all Key Stages and the associated table and number bond trainers provide excellent practice. There are sample versions available on line and special rates for home and tutor use. These programs are most valuable if used collaboratively so that strategies can be discussed and developed. They therefore provide an excellent way for parents or others to support learners. Maths Circus Acts 3, 4 and 5 (Age 5 to 14 years). Twelve different games can be played and each one has five levels of difficulty. All the puzzles require reasoning skills. There are straightforward instructions. 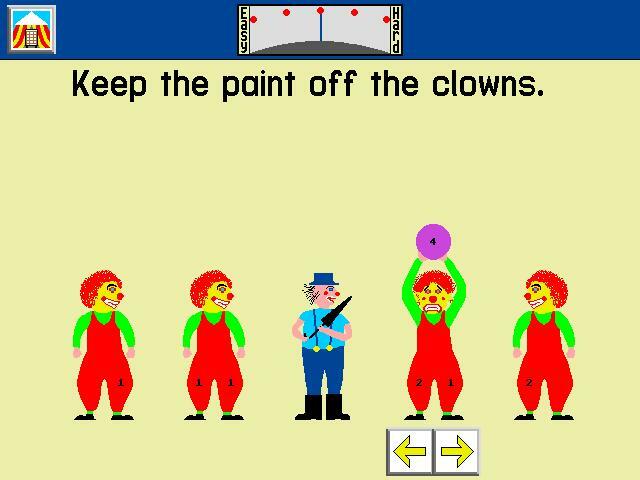 The colourful graphics relate to circus life with seals, lions, high wire acts etc. The early levels can be solved by trial and error, but learners gain the greatest benefit if they verbalise their reasons for following a procedure to solve a puzzle. For teachers there is also a useful set of 24 activity sheets which can be photocopied. Zoombinis Adventures (Age 7 to 14 years). Zoombinis are delightful little creatures with different feet, eyes, heads and noses. In their adventures they have to be guided through different obstacles which needs careful observation, trial and error and logic reasoning. The programs are very well presented with superb sound and animated effects and are very enjoyable. Users will gradually gain confidence and learn the importance of working logically as they use these programs. NB There is now an iPad app of the original programme, as that will no longer run on newer versions of Windows. Many secondary schools now use web based reources to support their teaching. This is particularly relevant to those working towards external exams. Such sites usually contain video clips explaining methods, followed by examples for the student to tackle. Sites such as www.mymaths.co.uk, www.hegartymaths.co.uk and the PiXL maths app require the school to register and pay a subscription. The sites can then be accessed at home for revision or homework. Others such as www.conquermaths.com allow individuals to subscribe. There are disadvantages to this approach. Firstly the method demonstrated my not be one that suits the learner. The practice examples require just the answer to be submitted and marked, which does not encourage the student to show the steps in their reasoning, which is essential in the external exams. The newer stype of GCSE papers, in particular, emphasise problem solving and the ability to explain how the result was derived. © B.D.A. New Technologies Committee. May 2015.